Doom (2000) Average 0.00/5 - out of 0 total votes. An all-new, epic adventure starring Doctor Doom! Trapped in the deadly deserts of Counter Earth (a.k.a. 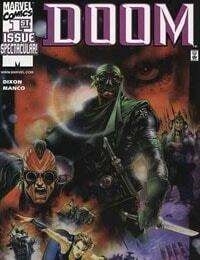 Doomworld), an armorless Victor Von Doom (a.k.a. the coolest bad guy of them all) battles for his very survival! To suceed, he must conquer the elements and rebuild his empire from nothing, destroying all those who would dare oppose his might! But his quest for power leads him into the hateful hands of Al-Khalad, and hard labor in his slave pits! What will happen when these two unyielding forces collide? One thing is certain: Doom will not be denied! Wrapped in steel and scoured by swirling sands of time, this sweeping saga of exotic locales and explosive action will at last fill in the gap between the events of FANTASTIC FOUR #25 and issue #30, and fully explore the inner workings of this captivating character! Brought to you with style by the top-notch creative team of writer Chuck Dixon (MARVEL KNIGHTS) and penciler Leonardo Manco! Remember how great Manco's art was on the sold-out BLAZE OF GLORY limited series? Now just imagine him drawing Doom!